Vanity’s Fiend is our Throwback for Thursday, and it still finds itself in the meta. 2400ATK is pretty standard for a Level 6. Locks down all Special Summoning, a fantastic Continuous Effect for an easily summoned monster. Not being able to be Special Summoned hurts this card, but doesn’t make it unplayable. This is a card that is a must in anti-meta decks, several side decks, and Monarch-focused decks play this to add lockdown to their tribute summon effect strategy. It has support behind it and is also an Allure of Darkness target. Even decks that tribute summon can use this card as a stall tactic. Still a great card to use in the side deck or in the main deck if it fits your strategy. 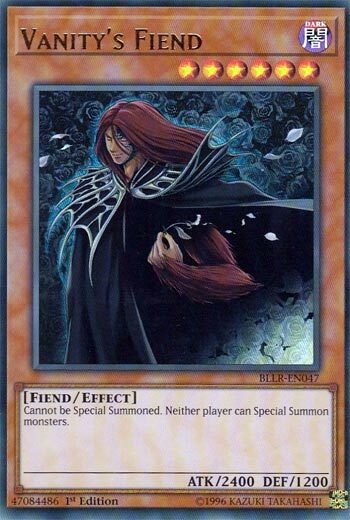 Throwback Thursday this week is probably one of the Tribute Monsters in this game left that are worth Tribute Summoning, Vanity’s Fiend. Vanity’s Fiend is a Level 6 DARK Fiend with 2400 ATK and 1200 DEF. I won’t go on about DARK and Fiend anymore. The stats are nice for a Level 6, though it would of been nice if this did have 1000 DEF for those Monarch cards, but those cards were still about 7 years off, so I can’t get mad at them for not preparing for that far into the future. Vanity’s Fiend cannot be Special Summoned, which I am typically not a fan of, but it helps balance this card and it makes sense as while this card is on the field, neither player can Special Summon monsters. Vanity’s Fiend can be hard to out if you cannot Special Summon, it can be hard to Normal Summon a monster with 2400 or more ATK with great ease. Vanity’s Fiend being a simple floodgate is great and has made this card stand the test of time. Keep these on hand, you never know when your deck can make great use of it. Art: 4/5 More evil than Majesty’s Fiend. Fun Fact: This is the only card in the game that has an Ultimate Rare print in two different sets, the most of any card. Any other card has 1 or no Ultimate Rare print. Ahh, now it IS Thursday, this IS a Throwback, and a damn good one too. Vanity’s Fiend is more or less the Royal Oppression in Monster form. (No cost in Lifepoints either, but I digress). Neither player can Special Summon, and this card, appropriately enough, can’t be Special Summoned either. 2400 attack is solid for one Tribute (we know this, of course) and Dark/Fiend are good (so Necrofear like this card, and various Fiend/Dark Decks can play this, but it’s splashable as well, because of the prevention). It’s a seemingly simple effect, which has kept this card in popularity in waves as time goes on. It’s fun that it can certainly have it’s own Deck(s) built around it, but it can be Teched/Sided in too.